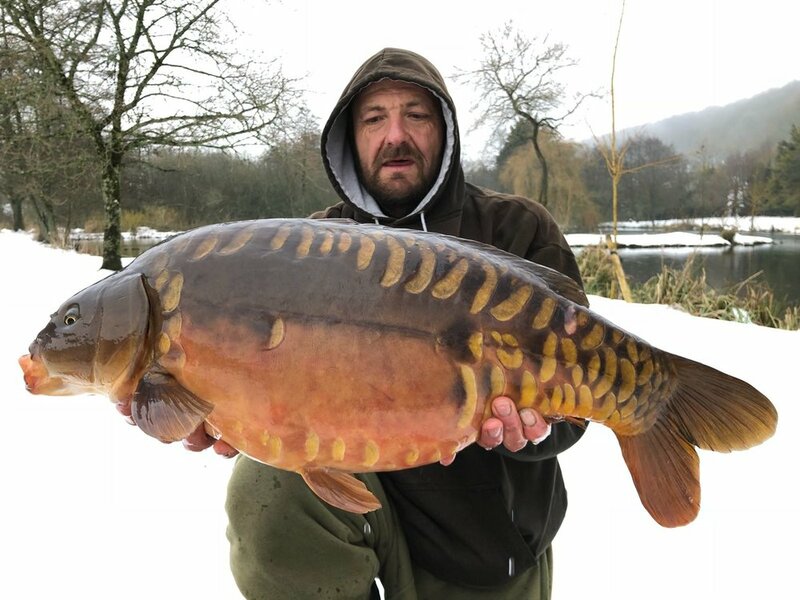 Paul Hunt called it “a perfect storm” as the Beast from the East and Storm Emma collided and gave him one of the finest hauls of snow carp ever. Targeting Milton Abbas in Dorset, Paul managed an incredible 15 fish to 39lb, all while the white stuff lay on the ground last weekend. Getting through 15kg of boilies in his four-night session, Paul also caught mirrors of 35lb 7oz, 32lb 4oz and 28lb 5oz. A 28lb 6oz common was also part of his mega hit. As the snow came down, Paul confidently baited up with 3kg of CC Moore Pacific Tuna boilies. He said: “I had a 20lb-plus common just before dark, then that night I had a 39lb mirror and another 20lb-plus common. Look at the colour of this 28lb 6oz common! After a quiet second day, nightfall brought a flurry of five fish including two 28-pounders. A 20lb-plus common rounded off the session before Paul had to carefully extract his snowbound van.